The Digital Media Labs at Leeds Beckett University provide students with advanced computer facilities and are equipped with a vast range of industry standard software packages. I was asked to produce this guide as an introduction to the use of these resources, health and safety and good habits to follow during their studies. Learning and technical support for students is reinforced with this handy booklet which is handed out to freshers at their induction sessions throughout Welcome Week and during the academic year. All eventualities are covered, from setting up a print account to producing finalised artwork on either our large format plotters or laser printers. Digimap is a web-based service delivering a collection of databases containing maps and geospatial data. It is available by subscription to UK academic establishments for the purposes of education and research. I created this guide to clarify what Digimap offers, the steps taken to register for an account and how to log in and use the site. Our large format KIP scanner allows students to scan wide format documents for their project work. 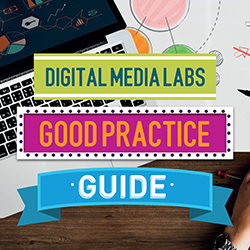 This guide provides step by step instructions on how to use the equipment, along with advice on selecting appropriate file formats. SketchUp by Google is a conceptual 3D digital drawing tool that is used by Architects, Landscape Architects, Interior Designers and Graphic Designers. This guide provides students with a basic introduction to the software along with links to online tutorials and further resources. During my time at Leeds Beckett I’ve also assisted the Business School with their National Student Survey campaign. 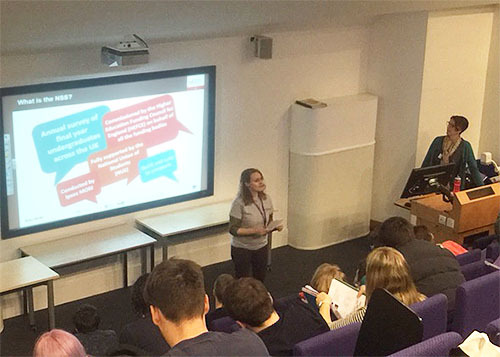 I directly addressed an audience of around 100 students in a lecture theatre, to promote the NSS and the market research carried out by IPSOS MORI.